Portland’s Eastside has not seen streetcars since the 1950s, but on February 1, 2010 the first tracks were laid east of the river for the Portland Streetcar Loop Project, a 3.3 mile extension to Portland’s existing streetcar route. Exciting news! Or bad news, if you hate streetcars! Today the first rails went in for the Eastside extension of the Portland Streetcar. The rails are being welded together in a staging area up the hill on Lloyd Boulevard, and installed on NE Grand Ave. The stretch directly in front of Metro headquarters is already in place. Construction began in 2009 and will mostly be complete by the end of 2011. 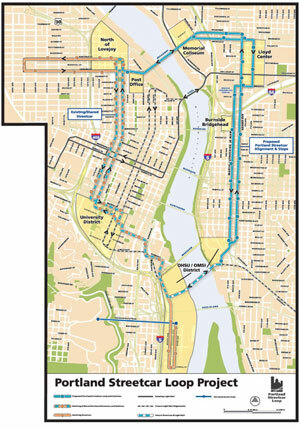 One last piece to close the loop, a new bridge across the Willamette between the Marquam and Ross Island bridges, will have to wait for the Milwaukie light rail project. Six new streetcars for the expansion will be manufactured locally by United Streetcar, LLC.